Bing Ads rolled out some handy updates to Bing Ads Editor (BAE) last week. Here’s a quick rundown for the next time you log in. 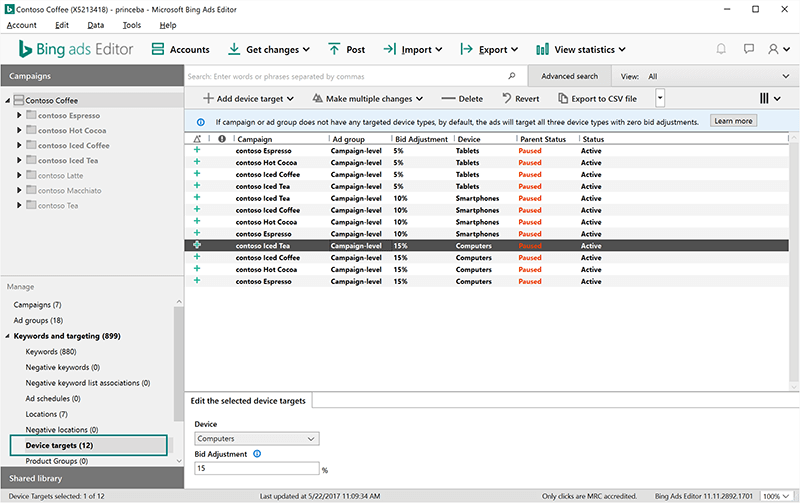 The most requested update here is the ability to select multiple campaigns or ad groups for bulk filtering and editing, as well as copying and pasting multiple items from one account to another. This is only available in the Windows version of BAE. Hopefully, it will roll out to the Mac version soon. With the recent changes in device targeting and bid adjustments, Bing Ads has added a “Device targets” menu option in the left pane in Editor. Here you can manage targeting and bid adjustments. Under “Locations,” now you can set multiple radius targets with different bid adjustments for a single location. For example, you might want a higher bid adjustment for a five-mile radius than for a 10-mile radius. Finally, you may also notice it’s faster to navigate, edit and get data from different statistics views in Editor due to a change in the way data is cached in the desktop tool. The post Bing Ads Editor updates: Bulk edit & copy multiple campaigns, manage device & radius targets appeared first on Search Engine Land.